UPDATE: download the REAL Clyde Hart’s 60 page Training Manual from the 2007 USATF NPEP Conference. There are numerous articles on Clyde Hart’s coaching methods floating in cyperspace. His classic “published” blueprint to his 400m training can be found here or here in PDF format. From American Track and Field magazine, written by Andy Friedlander in 2005, a nice 3 page scanned article on Train S-L-O-W-E-R to race FASTER in PDF format. But I recently came across this little known original article (now it will be well known!) from www.sports-fitness.com which is also Sonia O’Sullivan’s Coaching web site. It also appears in Sprintinc in a 4 part series, and copied everywhere on Let’s Run and Charlie Francis forums, just to name a few. It is quite lengthy, 12 pages in all, but well worth the time to read it in full… over and over again. 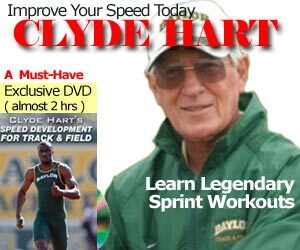 Click here to go to Page 1 of Clyde Hart: coach to Michael Johnson and Jeremy Wariner from www.sports-fitness.com.